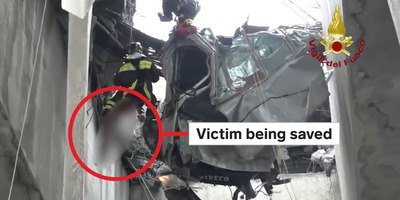 Twitter/Vigili del Fuoco/Business InsiderFootage posted online by Italian emergency services shows a blurred-out victim being lowered from the wreckage of what appears to be an Iveco van. A huge highway bridge collapsed in Genoa, northern Italy, on Tuesday morning, killing at least 39 people. But some have been pulled alive from the wreckage, including one victim who was pulled from a mangled vehicle suspended high above the ground. The victim had been stuck in a smashed-up Iveco vehicle, likely a van, wedged between two supports of the collapsed bridge. Footage shared on social media by Italian firefighters show two men lowering the blurred-out victim to the ground, where he was stretchered away. 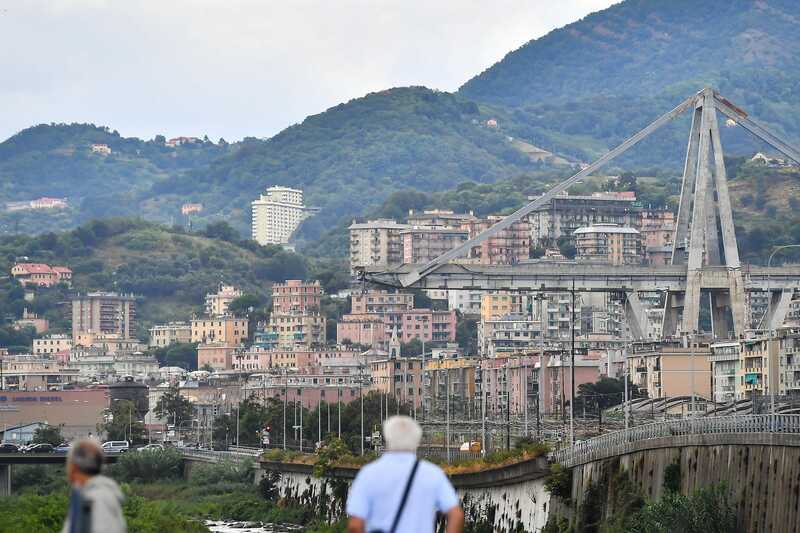 Authorities confirmed on Wednesday afternoon that 39 people died when the Morandi Bridge fell apart, sending cars, concrete, and steel plummeting more than 150ft to the ground below. But some people survived the deadly collapse. Footage posted on social media by Italy’s firefighting agency showed rescuers helping a person who was caught in a mangled vehicle wedged in the concrete wreckage of the bridge. The video shows rescuers lower the person to the ground with a winch then put them in a stretcher and take them away. The video blurs the person being rescued. The service does not identify them, and it isn’t clear precisely what their condition is. Rescuers searched through tons of concrete and steel after a section that was about 80 meters (262 feet) long and 50 meters (164 feet) above the ground. The bridge crossed over railway tracks and some buildings as well as a small river. An investigation is underway to find out why the bridge collapsed. It was constructed in 1967 and renovated in 2016. The director of the motorway operator Austrade for Genoa said on Tuesday evening that it was too soon to determine the cause. “The collapse was unexpected and unpredictable. 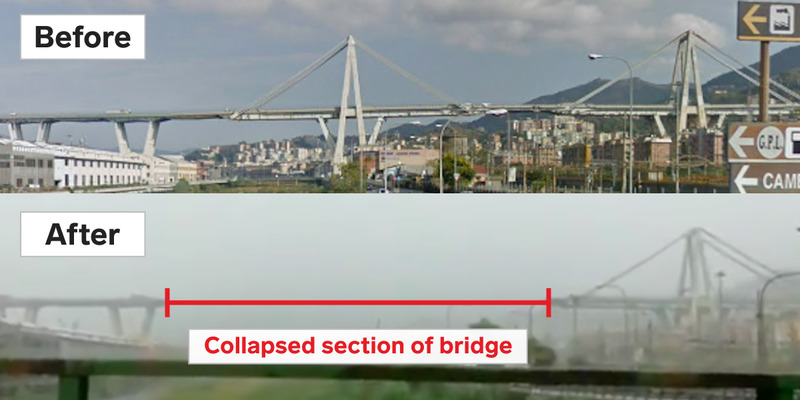 The bridge was constantly monitored, even more than was foreseen by the law,” Stefano Marigliani, Austrade director for the Genoa area, told Reuters. “There was no reason to consider the bridge dangerous,” he added. Startling photos of the scene show a large portion of the bridge missing. Paolo Rattini/GettyThe bridge, part of the A10 highway, suddenly collapsed on Tuesday with cars on top. Cars were on the bridge when it collapsed, and people in the buildings underneath were also affected. 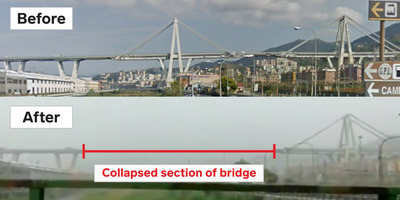 Twitter/Google Maps/Business InsiderThe Morandi bridge before and after the collapse. Italy’s transport minister Danilo Toninelli said the collapse was “unacceptable,” and that if negligence played a role, “whoever made a mistake must pay,” the Associated Press reported.